Why Is Mercury So Far from the Sun? Our solar system is different from many others. While Mercury never gets closer than 0.3 AU from the Sun, many of the exoplanets we have discovered make our closest planet look distant. About 50% of all systems have multiple planets tightly packed within that distance, leaving astronomers to wonder why our solar system and the other half of planetary systems do not have any close-in planets. It is a common quip in planet formation and protoplanetary disks that if you have any type of problem whatsoever that you do not understand, you should try to solve it with magnetic fields! The author of this paper — Jake Simon — puts this problem-solving technique to good use. Simon specifically asks: Does a disk’s magnetic field alignment affect whether planetesimals can form at less than 0.3 AU? Planets typically form from much smaller planetesimals (10 to 100 km-sized) that slowly aggregate over time. Likewise, planetesimals also need to form from much smaller solid dust particles (cm-sized or smaller). However, solid dust faces a barrier to grow into larger particles: the meter-size barrier. When meter-size particles collide with each other, they break up instead of combine, preventing them from growing in the usual way. The only way solid dust can cross the meter-size barrier is to circumvent it by becoming dense enough to gravitationally collapse into planetesimals. This can happen directly or through the streaming instability. After this occurs, the planetesimals that form are much larger than meter-sized and thus, free to grow to planet-size as usual through collisions. Gravitational collapse requires a high concentration of solid material to gas — a ratio known in the field of planet formation as a disk’s metallicity (denoted by Z). If the inner region of a disk at less than 0.3 AU has a low metallicity, the disk cannot create planetesimals this close to the star. Without planetesimals, planets cannot form. Instead of investigating a mechanism for increasing the concentration of solids, Simon looks into whether the orientation of a disk’s magnetic field can decrease the concentration of gas. Since Z is a ratio, lower gas densities also create higher metallicities that help planetesimal formation. The gas is forced to balance itself out by exchanging momentum with the adjacent rings, causing it to slow down over time and ultimately feed all of the disk’s momentum to the outer part. As the gas loses angular momentum to the outer disk, it spirals inward. Eventually, the gas in the inner disk will spiral inward enough to accrete onto the star. This process by which the disk accretes is known as shear flow. Disks that are more viscous will flow more easily, causing them to deplete faster than disks with lower viscosities. Figure 1. Radial metallicity profiles for the aligned case (solid black; top) and the anti-aligned case (dashed blue; bottom). For each case, the dotted lines (middle) of the same color show the required metallicity to form planetesimals over a range of radii. At less than 1.0 AU, the aligned case has a high enough metallicity to form planetesimals (the solid line is above dotted black line), but the anti-aligned case never has a high enough metallicity (the dashed line is below the dotted blue line). Simon knew from previous work that the orientation of a magnetic field can greatly affect the level of viscosity in the inner disk. If a disk’s magnetic field aligns with its angular momentum (such that the two vectors are pointing in the same hemisphere), it will induce stronger magnetic winds and non-turbulent laminar flow due to the Hall effect. These additional flows create a much higher viscosity than in a disk where the two vectors are anti-aligned and the Hall effect does not manifest this way. In the case where the field aligns, the gas in the disk is more viscous, causing it to deplete faster. This creates metallicities that are high enough to allow planetesimals — and subsequently, planets — to form at less than 0.3 AU. 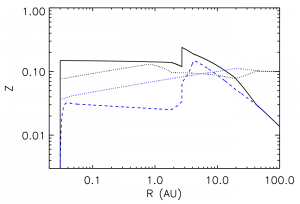 In the case where the field is anti-aligned, the gas in the disk is less viscous, keeping the gas density high and the metallicities at less than 0.3 AU too low to form planetesimals or planets (see Figure 1). If magnetic field orientations are distributed randomly, about half of them should be aligned and half should be anti-aligned. As a result, one would expect to find that roughly 50% of all planetary systems have planets at less than 0.3 AU, which is consistent with what we see in the population of known planetary systems. Figure 2. Radial surface density distributions for aligned (black) and anti-aligned (blue) magnetic fields. 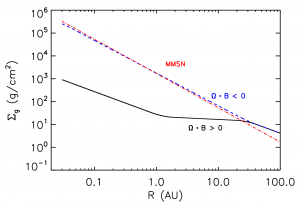 The MMSN (red) matches up better with the latter, suggesting our solar system may have had an anti-aligned magnetic field, which would explain why we do not have any planets within Mercury’s distance. How was our Solar System’s magnetic field aligned? When Simon calculates the disk’s metallicity distribution as a function of radius for both the aligned and anti-aligned magnetic fields, he notices that the anti-aligned case closely resembles the metallicity of the Minimum Mass Solar Nebula (MMSN), which is intended to model our solar system’s disk structure before any planets formed. If this resemblance has any bearing, our solar system may have had an anti-aligned magnetic field that prevented any planets from forming closer in than 0.3 AU, thereby offering a possible explanation as to why Mercury is so far from the Sun compared to the closest planets in roughly half of other planetary systems. 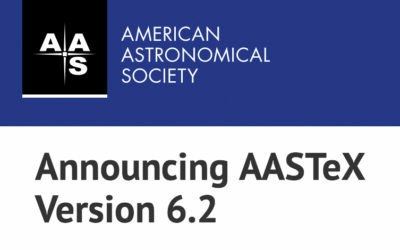 I am a 1st-year graduate student at the University of Arizona, where I am working with Kaitlin Kratter on studying planetary dynamics and planet-disk interactions through numerical simulations. I am from Queens, NYC. Pingback: why is Mercury so far from the Sun?